Opinions and other personal stuff about my journey as a white mother to children, who are black. “Mama, I think my swimming teacher is racist.” Kal told me over supper one evening, a few years back when he was 7. “What makes you think that?” I asked, (my first instinct a diffuse hope that I could frame what he had experienced into a harm-less alternative reality). My child hadn’t come home sad that he was bad at swimming or feeling bad for doing something wrong. Instead he had used his observations together with his intuition plus his knowledge about the world he lives in to interpret an uncomfortable experience with a white authority figure as racist. This was an important moment for us. I could have asked him, are you sure? We could have gotten into a conversation about how else to understand the teacher’s behaviour. After all, anything would be preferable to the reality of racism from a white teacher at my son’s school. For the sake of my momentary peace of mind, I could have gas-lighted my child in the manner black people get tricked into self-doubt every time a white person defends their implicit racism as something else, like asking black shoppers at Woollies where the tomatoes are and then crying: I am not a racist, I made a mistake (yes, a racist mistake). With a heavy heart and often feeling guilty for “robbing my children of their innocence” I had acknowledged and given them words for the often subtle every- day racism they experienced in my presence from when they could first talk. And sometimes it happened without me being there. When the waiting staff at our favourite restaurant didn’t recognise or even serve my four- and six-year old children on the one occasion they went there with black friends of ours, we had to explain to them, that black people get treated differently in mainly white spaces and that this is also racism. They most likely have experienced some forms of racism before these events, that I observed or was told about, before they even had the word for it: a mother shielding her white child from their blackness in the sandpit, white children making fun of their hair, or story books equating light skin to beauty. It occurred to me that day, that without those conversations, without the basic language and understanding about the many forms of racism, my son might be in that teacher’s class week after week thinking he is not good enough, or there is something intrinsically wrong with him for constantly angering his teacher. Instead he was able to understand the basic truth about racism: racism is about impact and perception and not about the intentions of the person being racist. As a result my child didn’t allow racism to impact his sense of ability or self-worth. He didn’t doubt or ask himself (as racism wants black people to do), what is wrong with me. He was able to identify and spit out the poison before it got to his core. He recognised the racist white school teacher, who might even think of himself as inclusive and colour-blind, but gets angered just a little more by a black student, who will always have to try just that little bit harder to satisfy the teacher’s standards of “good enough”. He had tasted the poison and managed not to let it get into his system, but the bad taste would remain in my child’s mouth from here on out. This (for me) was the devastating part. Fast forward a few years, he is now 10. His understanding of racism, sexism, misogyny far exceeds any knowledge I had at that age. I am proud of him, but also sad that he has to know all of this. Eventually I kept quiet, allowing him to lie silently in my arm, while I pretended to read. After a while I felt him shift, as he turned his head into the pillow. If you know my child, you know he doesn’t cry easily (like the others). It’s not that we discourage it (on the contrary) he simply doesn’t feel the need to. H e is able to talk about his feelings readily and easily and tears are often not part of his release. “I am tired.” He whispered into the pillow. “Did something happen that made you so tired?” I tried again. He told me about his friends, the children he feels closest to, who claim they don’t understand him anymore. How, when his white friend “affectionately” called his (adopted, black) friend her “little slave”, my son pointed out that this was racist. How the white friend instantly became teary and defensive (we’re just playing, it’s not racist, he’s my best friend) and the black friend felt the need to defend his white friend ( why is this racist, it’s ok if I let her say it). How on the same day another friend ( male) repeatedly slapped a girl’s bum and my child called him out for “harassment”. How the boy defended himself saying, he is only ten and he can’t be accused of such. How the girls ran shrieking from the boy, but still defended him (why are you getting involved, this is none of your business). How when he addressed them all together, explaining “consent” (you have to say to him that you are ok with him touching you, otherwise he is not allowed to), they all laughed at him. He said they are his friends and he knows they were “not trying to be racist”. At the same time he felt intensely uncomfortable as he had told them before that calling a black person by any animal name was racist. How his friends think that liking a black person means that they cannot be racist. Kal is popular in his school. Everybody wants to be his friend. There is no bullying or shaming or “overt” racism happening to him (mind you that shampoo ad could easily go viral …). My son is exhausted at having to educate (and be ridiculed by) other people’s children. The adults who are supposed to teach these children, are failing my son. They are also failing other children, who are like him: black and maybe adopted by white people. They are also failing their own children. The white parents of my son’s black friend, who doesn’t mind being called a slave, are failing their child by not teaching him about racism. He will grow up internalising feelings of “not-good-enough” and possibly project these feelings onto other people who look like him. We spoke for a long time. The only comfort I could offer was to validate his feelings and help him understand the context. I realised then that the real tragedy is not that we rob our children of their innocence when we tell them about racism (and other forms of violence and oppression) from an early age. The real tragedy is when we fail to tell them about it and inadvertently turn them into perpetrators too young to understand or even be held accountable for their actions. To the mother, who smiles at her son who playfully hits a girl’s bum: not talking to him will not preserve his innocence. Even when that girl laugh-shrieks and runs from him, seemingly inviting him to follow: this is not consent. Talk to him about consent. It’s not that difficult (google gives good tutorials). To the white parents of my son’s black friend: Tell your child about racism. Point it out to him over and over again until he has the language and skills needed to negotiate his predominantly white world without losing his sense of identity and self-worth. Connect him to adults who are black, who can role model coping mechanisms. Be his ally. Please. Teach. Your. Children. About. Racism. Tell them, it exists in all of us white people. Tell them it is not their fault but it is important to know about it. Tell them it may start with them thinking that black African hair is not as beautiful as blond straight hair. Tell them it is not ok to compare black people to animals. Tell them they can be a monkey if they wish to, but they can NEVER compare their black friend to monkeys – it is not difficult to understand: White people have killed black people and justified their crimes by pretending black people were animals. Therefore you can NEVER ever compare a black friend to an animal ever again. Tell them, to stop and listen when a black friend tells them something is racist. Tell them to keep quiet and come home and talk to you about it so you can explain to them. Racism is not what you intend (we none of us WANT to be racist, except of course for the ones who do) but what your black friend experiences often, maybe even every day. Tell them they will never know what it feels like. Therefore it is important that they are kind and listen to their black friends. Tell them that on some days their black friends will experience racism even from your children. Tell them to believe them. Fellow white parents, what I need you to understand is that your child’s innocence comes at a price for my child. One day your white child will be a white adult, maybe a teacher claiming innocence ( a white form of ignorance) while committing racist violence against the black children in his class. Wonderful piece, thank you. I'll share the link on Facebook. PS Do peep at my blog "Another New Life" by Melanie Steyn on Wordpress. Thank you for this important article, and for sharing your feelings. Your son and his friends are very fortunate to have your understanding and kindness. I hope more people get to read your words. Again, thank you! Thank you for this. I am white and so are my children. I’ve called them monkeys since I was pregnant, and have often referred to other small children as monkeys. I am outgoing and friendly with children and babies everywhere I go. But I have caught and stopped myself a number of times when talking to moms of color and NOT referred to their children as monkeys. I say “monkey” with love and affection in my heart, but I know it’s not gonna sound right coming from a white lady to a brown child. 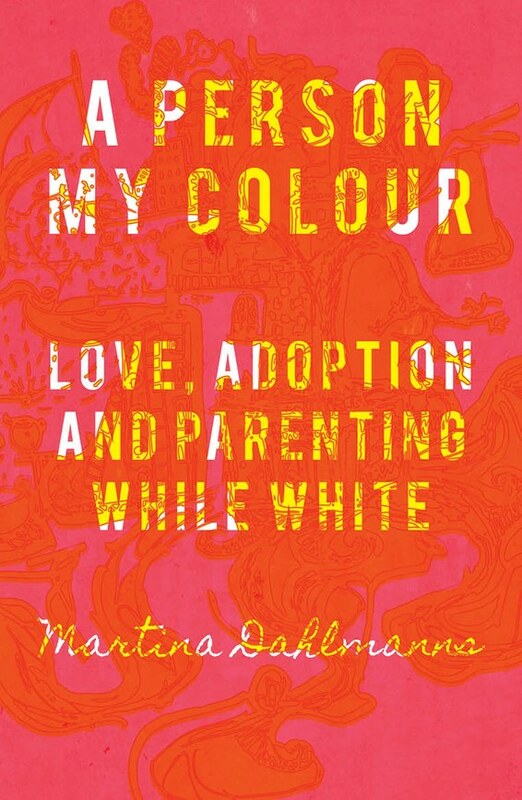 To those who have asked, this is the link to my recently published memoir about Love, adoption and parenting while white. Take the quiz to see if you have white fragility! Martina Dahlmans 2018. Awesome Inc. theme. Powered by Blogger.